Enjoy a unique trip like no other! You’ll discover the captivating views of Barcelona’s beaches and its skyline in one of the most authentic ways available. 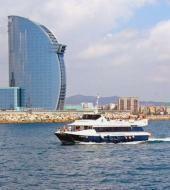 The journey will take you out of the old harbour - the Port Vell – and along the Barcelona coastline. Sit back and relax in the Mediterranean Sea breeze. The second is a 1hour 30 minute tour along the seashore where you’ll be able to soak up the sun for longer as you sightsee in the motorised Golondrinas. Meeting point: Portal de la Pau, s/n. Moll de Drassanes (opposite the Columbus Monument). Mertro: L3 Drassanes.